Villa Sun, Exposition Ouest, piscine chauffée solaire! Eh bien meublé 3 chambres 2 salles de bain maison. exposition Ouest. Piscine solaire chauffée. Très propre. Bien équipé. Des lits confortables, un lit king deux reine. Carrelage dans la zone, tapis vivant dans des zones de chambre à coucher. Marque nouvelle salle de bains rénovée Master. Tout est en pleine forme! Seules les chaînes locales, mais roku et WIFI inclus. One TV dans le salon. Vous ne serez pas avoir beaucoup de circulation ici par rapport à Cape Coral et Fort Myers! House est dans un Cul du Sac de East 5th Street. Proche des commerces et des restaurants. (5 minutes en voiture) Dollar Stores, Wal Mart, Publix, Win -, Walgreens, CVS, Aldi ouverture en Janvier 2017!, Bealls Outlet, et tous les grands restaurants de restauration rapide. Miami: 2 heures, Orlando: 3 heures, Tampa: 2 heures. Lehigh a 3 belles golfs 18 trous. Un 9 trous. 30 minutes pour la plupart des plages. L'électricité sera facturée séparément pour les longs séjours de 14 nuits. La piscine est à nouveau projetée. Cet endroit vous offre tout ce dont vous avez besoin pour des vacances dans la région de Fort Myers. Vous pouvez vous attendre un très propre et decend lieu meublé. Meubles de terrasse dans la véranda. Laveuse, sécheuse dans le garage, cuisine entièrement équipée, serviettes de bain, linge de maison. Détendez-vous à la piscine ou sur la grande terrasse de la piscine. Beautiful house in a quiet neighborhood. Had everything we needed for our stay in Fort Myers. The deck and back yard was enjoyable to sit and relax. Great host. Nice little getaway in LeHigh Acres. Very clean and perfect size for our family visit. Well appointed kitchen. Beautiful Master bedroom and bathroom. Outside patio was very nice to enjoy the weather. Too cold for swimming but the pool was nice size and clean. Plenty of dining space. All the comforts of home. The location was great and still close to Ft Myers without all the traffic. Sylvia was very nice to work with. She made sure we had everything we needed. Absolutely no complaints! Clean, well maintained, the amenities of home! We will be back!! We were somewhat unhappy that the house was not as pictured. Of course it was damaged by Hurricane Irma which totally left the house without the screened in Lanai. Also the pool was advertised as “solar heated” which much to our disapointment was never warm enough to swim in January. So I would caution folks about being certain of what you are getting in spite of the photos in the listings. We also had to do some intitial cleaning of a few things... outside windows, kitchen Lighing panels were filthy which we removed and wahsed and changed one of the. Fluorescent fixtures. Now all that being said, the house was comfortable, beds were ok, kitchen was well equipped, towels were a bit shabby, and we brought in some of. Our own from our motor home which we had with us. House was relatively clean, but my wife is a “cleany” and had to bring it up to her standards. Because the pool was not coverered we were cleaning up leaves on the patio often and the repairs to the lanai were supposed to have been completed during our stay but never happened. For us we wanted to be closer to restaurants, shows, and shopping, but soon learned that ALL of that was a 30 minute drive to Ft. Myers... Our error in not checking how far ALL was from Lehigh Acres. “My bad”. We had guests stay with us for a week, and all in the house worked well. The owners were cordial and gave us a small discount because of the missing Lanai which was appreciated. Would suggest to anyone exploring for rentals that you carefully read all reviews and ask many questions. Do not be mislead by beautiful photos. And all in all we did enjoy our month stay here in January. Thank you Lerry for your detailed review. I am glad you liked the home and I am sorry you were unsatisfied with some things. Since it was your first time booking a vacation house you maybe expected a "just perfect" place. You booked the home for an already discounted price knowing there was no screen, since it has been ripped off by the hurricane. On top of that we gave you a huge discount for your inconveniences. The poolscreen has been replaced shortly after your departure due to the companies being completely overbooked with orders. Unfortunately the solar panels could not make up for the 30 degree cold snap in January of 2018 and you were not able to swim. Windows are being cleaned twice a year, but as you said your wife is a "cleany". We tried to convenient you as much as possible by providing an extra discount, doing some extra corking and providing you with extra shade. Had an amazing, relaxing, affordable, MUCH NEEDED, long weekend, thanks to Sylvia! This home has everything you could need. 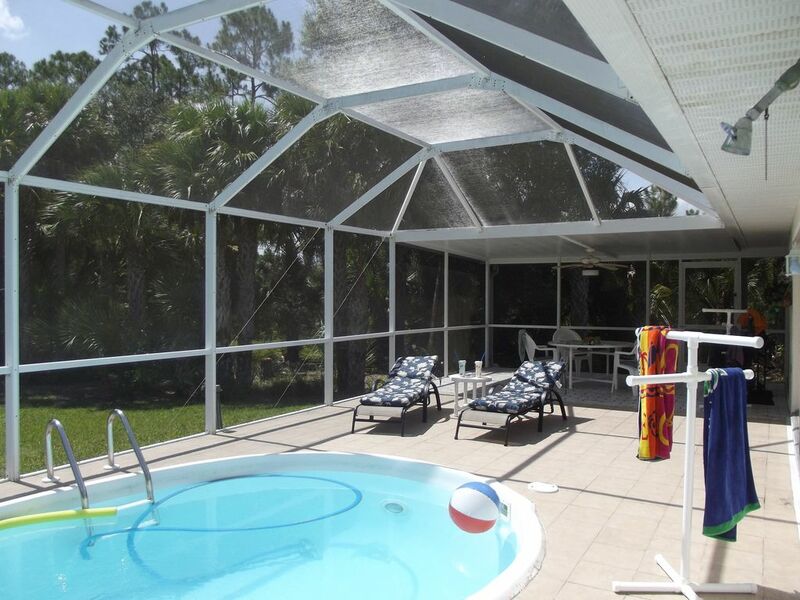 Besides the obvious amazing screened in pool, which was perfect for floating & forgetting all about life's stressors, Sylvia has the most well-stocked kitchen I've ever rented!! Any gadget, utensil, or cookware you could need was there! She even had a spring-form pan...I don't even own one of those!! There were ample towels, and one of the most beautiful showers I've ever seen in the master bathroom. Movies were provided for time to just relax in the living room. You really never needed to go out except for groceries. I'd totally rent from Sylvia again. She was very easy to communicate with and very quick to reply to my questions. Can't wait for my next getaway. Thank you very much for this wonderful review! I am always trying to provide the best service I can so our guests can really enjoy their stay here in Florida! Hope to see you again soon! Parcs: Manatee Park, Parc Lacs, etc. In addition to the rental price there will be a $200 security deposit as well as a $120 cleaning fee. Nightly rate only applies for a week long stay. For anything less than a week the nightly rate will be $120. Electricity will be charged depending on usage for stays longer than 14 days.